Bally's Air Aces was the very first pinball machine to feature drop targets. It has a bank of 9 drop targets that the player must shoot down. It has a world war II themed airplane premise and is convertable to Add-A-Ball. 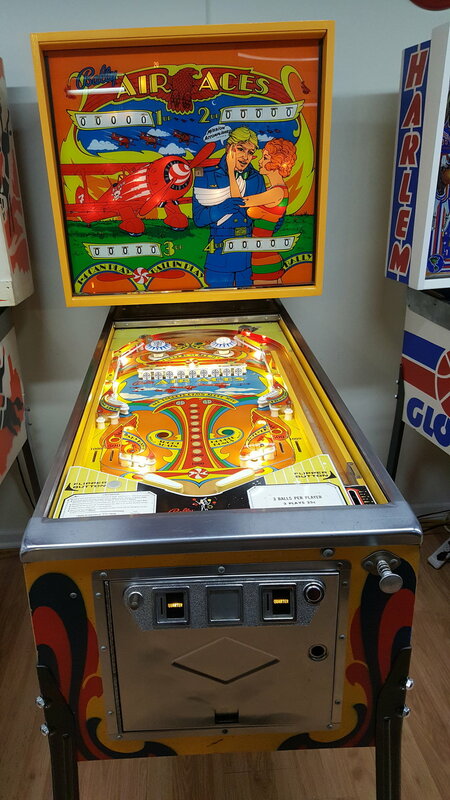 Cabinet has been freshly touched up and the machine has been completely restored. LEDS have been installed in the backbox as well as in the General Illumination playfield. New rubbers all around and freshly touched up and polished playfield. All mechanics have been tested and verified. Brand new drop targets, thumper caps and freshly rebuilt thumpers.